On Wednesday 21 February, Year 8 students were involved in the Cyber Safety Awareness Day held at the College. The day included a range of activities designed to teach the boys responsible digital citizenship and allow them to understand the implications and potential impacts that cyber bullying and the poor use of technology can have on their lives. The day started with an introduction by Learning &Technology Prefect Michael Agius, about digital citizenship and what it means to grow up in the technological era. The boys then watched a Brainstorm Productions performance titled “The Hurting Game”, based around the themes of social exclusion, cyber bullying, positive friendships and right relationships, encouraging students to be an up-stander to bullying and avoid damaging their digital reputation. During the middle session, students were privileged with the opportunity to hear from Old Boy and principal psychologist of ‘Northshore Kidspace’ Brad Marshall, who specialises in the treatment of young people experiencing excessive internet use and related disorders. His talk was highly valuable for the students in debunking both social media and gaming myths that often leads to abuses when excessive time is spent on internet and social media sites. 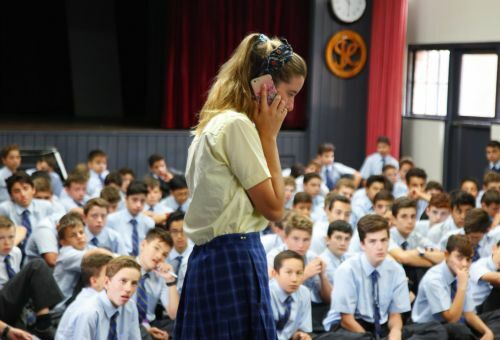 The day ended with an opportunity for Year 8 students to work with their homeroom teachers on a series of modules and activities based on the short film “Tagged”, which was commissioned by the Office of the E-Safety Commissioner. The day was a wonderful and timely opportunity for the students to learn to appreciate the value of the online digital work as well as its challenges, and understand the best ways to have positive and safe online experiences.